The state has decided to upgrade infrastructure in the southern region, cutting travel time to central Israel in half with a new train line. Israel Railways on Sunday opened a new second track on the Be'er Sheva-Tel Aviv route, slicing commuters' travel time from 90 minutes to a neat 55-minute trip. Included in the upgrade was construction of a number of bridges and 19 road-rail separations to ensure the safety of motorist crossings. 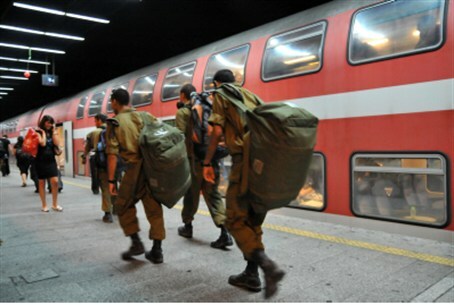 The new line is intended to run 24 hours a day, and will connect with the Tel Aviv line to Ben-Gurion International Airport and Nahariya. However, residents of Arad noted that the new train line does nothing to improve their prospects for employment, which are minimal due to their distance from the major employment centers of the country. The northeastern Negev development city is located at least an hour from Be'er Sheva. “There have been numerous hints of plans for a train line feeding to Be'er Sheva 'some time in the future,' but no such line has actually been built,” commented Michael, an immigrant living in Arad for several years. Dimona, once considered a comparable 'development town' in the Negev triangle, has long since acquired its own commuter rail line to Be'er Sheva, a major hub in the south.